A report released this week finds that renting an entire home on Airbnb costs about the same as a single hotel room in the home-sharing site’s 20 biggest US markets. On average, the daily rate for an Airbnb rental was $160.47 compared to $163.90 for a hotel room. In many of those cities—especially expensive ones like New York and San Francisco—Airbnb is also significantly cheaper. Unexpectedly, this report comes from ShareBetter, an anti-Airbnb lobbying group, and was funded in part by the hotel industry. Though it arrives at the conclusion that Airbnb costs on average as much as a hotel room in 20 big US cities—damning for a “sharing economy” company that has positioned itself as broadly affordable—a closer look at the data, compiled by analytics site Airdna, reveals it does not include shared and private rooms listed on Airbnb. “The comparison was made between Airbnb rates for rooms that were equivalent to hotels like condos and apartments,” Austin Shafran, a spokesman for ShareBetter, wrote in an email. 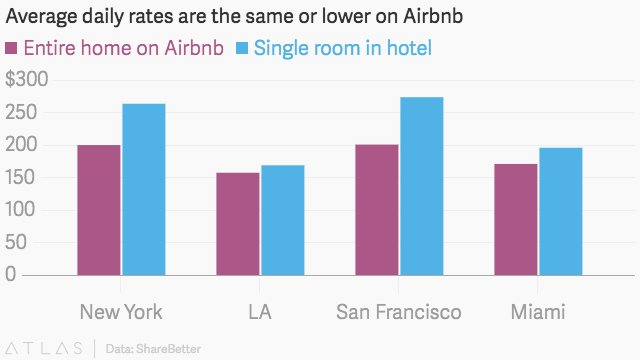 Airbnb has the hotel industry scared. It’s winning loyalty from casual vacationers and edging into accommodations for business travelers. Airbnb is also making it harder for hotels to jack up rates during particularly high-demand periods, like a local conference or festival. One way hotels have tried to fight back is through research. The industry has funded multiple studies to show that Airbnb’s rentals are largely illegal. The reports have helped them win support from politicians in many cities as well as from affordable housing groups that fear Airbnb’s effect on local housing stock.